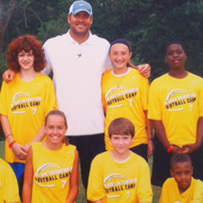 …to sign your youngster up for the 2012 Ben Roethlisberger Football Camp! Join Ben next month for some football instruction and fun at his Football Camp for kids, sponsored by ProCamps Worldwide! 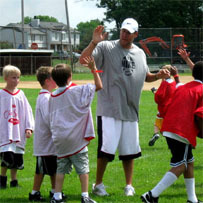 Campers will participate in daily games, stations, and skill contests. Each camper will be placed on a team according to his or her age. Each day, the campers will experience various stations, specializing in fundamental skills of football. Individual groups will be small to assure that each camper gets maximum instruction from the top football coaches in the Pittsburgh area. You can sign up for the camp here. You can watch videos from the camp here. 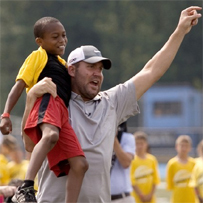 …they have five Big Ben Camp spots up for grabs!! You can register to win one of those spots for your child or grandchild at their website! No purchase is necessary to register or win, but you must be a legal Pennsylvania resident to enter! Winners will be selected on June 6th and will be notified by telephone or email. Sign up today and good luck!